It... it does?! Cueball, sometimes you just shouldn't open your mouth at all, because when you do, we see glazed babies. 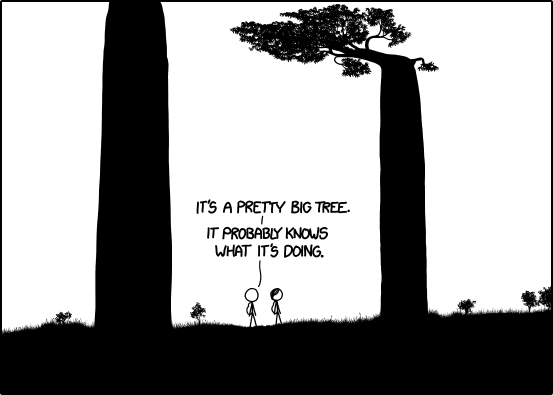 Of course it does: if a treewow, that can grow this big, decides that bending this way is a good move in life, then the last thing I'd be doing is suggesting that it's wrong simply because it is way bigger than me. It may be way bigger than me, but based upon my experience with trees, I'm almost certainly much, much faster. and I have opposable thumbs. and a chainsaw. Who gave the inquisitor a chainsaw? This seems extremely dangerous for those of us who have become accustomed to comfy chairs, chocolate, and burnt steaks. Edit: ...some of the wow trees have two main branches at the top. I think this one simply lost one side, say in a lightning strike, for example. I concur, a herring would be a good weapon. On a side note: Well done steaks are not burnt unless you don't know how to cook meat. §Preferably ablatively from orbit, but when we don't have the budget of NASA or the GLR, we make do with more terrestrial means. I was under the impression that we were throwing well done steaks... Oops. 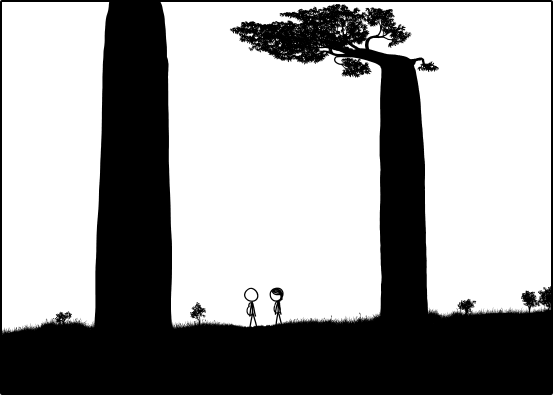 Cueball wrote: It's a pretty big tree. This suggest that perhaps Megan and Cueball are children. Older than La Petite, but still you enough to think that grownups have all the answers, so, it something is big (like sea¹ or crooked Baobab⁸), it must know what it's doing. I think footnotes in your sig is a bad idea... You can never change your sig without destroying all those posts you made with references. Oh, it certainly is. But if we only do things that make sense in the OTT, it'll quicky become a boring (and empty) place. In principle I only add to the list, so compatibility shouldn't be an issue¹¹. Kieryn wrote: Edit: Also, when I quote you, like this, I lose your footnotes. Certainly true. But I refer the honourable gentleman to the comment I made above. ¹²: I'm gonna get in trouble when my default list extends to the 11th footnote... Or actually, not really. They're clearly labeled as default footnotes, and are thus overridden by those in the message. Last edited by mscha on Wed May 22, 2013 6:56 pm UTC, edited 1 time in total. The first two are from the pre-expansion era, the third from after the expansion, the fourth from recently when they saw the baobab trees, and the last two from when they were walking along the river where it split. Last edited by Earthling on Mars on Tue Nov 10, 2015 9:02 pm UTC, edited 1 time in total. HAL9000 wrote: Wait, I think I know why this tree looks different than it did before (during the temporary zoomout). It's drawn all funny to show us their perspective of the tree, because a tree looks very different when viewed up close as opposed to far away. The top of the tree (from the point where it bends to the top) is skewed to the left, as if it had hit an invisible cieling but had kept growing after bending 90°, or if it were a wall poster that's taller than the wall and has the top part pressed flat against the ceiling. If that makes any sense. It's hard for me to explain. Thank you (and several others) for pointing out they had passed more trees. I tend to somewhat lose track of what's going in the comic when I'm kvetching up with the thread, and that was one of the things I missed. Well there's an explanation of molpies right there! Time traveling cuegans from a time when the frame is very zoomed out. You know what, I don't like this theory anymore. That would explain the tiny replica of the sandcastle: Cueball actually made it as a giant-sized sandcastle for tiny Cueball. It's a pretty big tree. It probably knows what it's doing. So has anyone else considered that the molpies are actually the campfire-builders and/or tree-markers? They do seem to be quite clever, and quite shy, creatures. Opiboble wrote: ...On a side note: Well done steaks are not burnt unless you don't know how to cook meat. I think the Inquisition has done a great service to the civility of our forum. It is the perfect kind of Inquistion: actively engaged, supported by the community, and inept ineffective. The recognized punishments of the Inquisition give the suggestion of being pleasant, then fall disappointingly short. So steaks smell really good when you're cooking them (apologies to our vegans), but when the Inquisitor doesn't stop, the heretic gets a charred, barely edible steak after enduring the promise of something savory. It's a fitting mock punishment for mock heresy. We joke about the Inquisition for mock offenses (since we have enough sects to guarantee that any dogmatic assertion is heretical to someone). But it sets the tone for how we keep each other in line. When we have real transgressions (that threaten the civility of the forum), then we've already set the right tone. We're used to taking lighthearted threats from each other when we violate our mock forum conventions, so we've been responding well to lighthearted (but serious) suggestions to stay away from actual mockery or flame wars. On topic: why is 7 angry at 6? I know right! (I hardly have a clue what he just said) But no in all seriousness, for an internet discussion, shoot, for any discussion, especially one that has gone on for so long (thanks to the OTC) it is insanely civil. We have touched on so much and not just started a stupid war, it is quite impressive. Maybe that was what Randall is aiming for with his OTC, is to have a generally civil, and long thread. all I have is something scatological happening after 7 ate 9. My mind might work in odd ways. ¹²: of course, all footnotes are susceptible to Footnote Injection Attacks! Yes but all quotes are susceptible to edits. Each time I see the bent tree, I see it looking down at the Cuegan with its hands on its hips. I've seen the same look from my wife. She's not amused with him. Only five spaces in the entire thing! Nice job! StratPlayer, I am mentally crowning you as the honorary James Burke of the OTT. Wow! I am flattered, humbled, and honored. I love James Burke and Connections! 1. James Burke was born in Londonderry, Northern Ireland? 2. There have been long disputes and discussion about the town's name, including efforts to formally change its name. Although it's legal name is "Londonderry" it is commonly referred to as simply "Derry". 3. "Derry" is also the name of the fictional town used as the setting for many of the works of Stephen King, including "It", the novel about the title-named clown-monster. 4. "It" is something, of course, that we are all waiting for, because the Alt-Text of the OTC tells us to. 5. While we wait, thanks to the talents of buffygirl, we have become a uniquely-hatted collective, much like The Red Hat Society. 6. The Red Hat Society was founded by Sue Ellen Cooper in Fullerton, California. 7. Fullerton, California is the home of the Fender Guitar company, started by Leo Fender. 8. One of the mopst popular Fender guitars is -- of course, the Stratocaster, used for my avatar. So, what do you know? I guess there is a connection! James Burke and Omri Katz appeared in Speed. Omri Katz and Cathy Moriarty appeared in Matinee. Cathy Moriarty and Kevin Bacon appeared in Digging to China. Montov wrote: On topic: why is 7 angry at 6? Yes, but what's the Erdős-Bacon number? Last edited by Dracomax on Wed May 22, 2013 7:40 pm UTC, edited 1 time in total. I hate to have to ask (again), but can y'all please consider cutting down or spoilering part of the quote, if you reply with a single line to a long post? mscha wrote: I hate to have to ask (again), but can y'all please consider cutting down or spoilering part of the quote, if you reply with a single line to a long post? Honestly, I try to do so, but I have been known to forget. Last edited by Rule110 on Wed May 22, 2013 7:47 pm UTC, edited 2 times in total. A mutant tree to me suggests genetic damage caused by radiation, so I'm sticking with my post-apocalyptic scenario. foilman wrote: A mutant tree to me suggests genetic damage caused by radiation, so I'm sticking with my post-apocalyptic scenario. Could it be ... a Teenage Mutant Ninja Baobab (hero⁸ in a half tree)? Also slightly late, but I wanted to say I really like this too! Great DD and artistry! Last edited by StratPlayer on Wed May 22, 2013 7:58 pm UTC, edited 1 time in total. Ah, but why isn't 6 afraid of octal? I guess we could do Seven Degrees of Blitzgirl or even a Blitzgirl-Number on the quote tree. But folks, be honest, this would just be a ridiculous mess.